Why is the CBC is above the law? OTTAWA – The CBC isn’t getting taken to the woodshed for airing vote results to western Canada on election night. In a letter to a complainant in British Columbia, Elections Canada said since the state broadcaster didn’t intend for their signal to hit screens in the west, no penalties will be dealt. 329. No person shall transmit the result or purported result of the vote in an electoral district to the public in another electoral district before the close of all of the polling stations in that other electoral district. This particular law was under debate during the last federal election and in my role as Director of the National Citizens Coalition, I participated in a number of television, newspaper and radio interviews on this terrible section of the Act. It also seems to be one of those topics that I write about during each time an election rolls around. Also, I usually pull Blogging Tories offline for three hours during election night in order to comply with the Act. If, for some reason, it isn’t immediately apparent was is wrong with the law, in the age of Twitter, Facebook, and blogs, it is unreasonable for Elections Canada to expect individual Canadians to keep Eastern results to themselves when many are ignorant of the details of the Act. Further, while there is the ideal of fair elections to respect, there is also the principle of free expression. Legislators must create laws that recognize and move with reality, not try to shape new ones. The National Citizens Coalition has history with this section of the Elections Act. In 2000, a BC webmaster named Paul Bryan published election night results from the east coast on his website and was subsequently charged under the Act. The National Citizens Coalition bankrolled his fight through the BC Supreme Court through the BC Court of Appeal to the Supreme Court of Canada where s.329 was deemed constitutional and legal because it ensured “informational equality”. Yet, lets understand “informational reality” while aiming to safeguard “informational equality” at the same time. When the tools of mass communication can exist in anyone’s hands, one must recognize a new truth. The mandate of Elections Canada is to protect the integrity of election results. In truth, the onus of protecting against premature transmission lies with them. They are the custodians of this information, in fact they likely swear an oath to protect it. To ensure “informational equality”, Elections Canada should keep all poll boxes sealed until polls close in British Columbia. Former Chief Electoral Officer Jean-Pierre Kingsley complains that this approach means Canadians won’t get “timely” results (in this age of mass media, no less). Yet, a higher principle of freedom of speech exists for Canadians who are unbound by any mandate to protect the information of Elections Canada. While mass media technologists armed with Twitter faced fines of up to $25,000 for tweeting election results, the CBC accidentally broadcasted the same to all of their viewers. Because there was no intent, Elections Canada argues, CBC will skate free. Yet, tweeters ignorant of the law (most of them) faced crushing fines. This also brings the fair and equitable application of the law by Elections Canada on some parties versus others. How is it we see progressive champions of progressivism at the CBC save themselves from what would amount to chump change for the Crown corporation while the small guy gets a hefty fine? Why can Elections Canada shrug its shoulders at the CBC but yet force a seven year $1 million Supreme Court fight for someone that wouldn’t have had a voice without the good financial supporters of the National Citizens Coalition? Why is it that Elections Canada raids Conservative Party offices over the “in-and-out” scheme where it has been shown that all parties have participated in one form or another of the same scheme? Why is it that the Manning Centre cannot register as a charity and do political work, while David Suzuki’s charity plays politics frequently? When laws are seen to be applied unequally, existing-only-on-the-back-of-a-napkin-only-type organizations like the Broadbent Institute think that they can use the special tax status of a political party like the NDP to funnel contributions through and issue tax receipts. Why is it that some laws in our society only exist to regulate some while elite institutions and causes need not worry about the same? Posted on August 31, 2011 Author Stephen TaylorCategories ColumnsLeave a comment on Why is the CBC is above the law? This morning I learned the terrible news of Jack Layton’s passing as the news spread instantly via Twitter. His final press conference in Ottawa this July left one feeling hopeful yet very anxious about the prospects of his return. Looking frail, weakened by a second bout of the disease, having fractured his hip during the campaign, the stomach was knotted. And this morning, it sank. Cancer is a terrible disease, and all of us will be affected by it one day — either ourselves or with someone we love. In a pan-partisan sentiment today and in the future, Canadians are united to better understand and perhaps one day cure the many variations of this disease. To most anyone that watches Ottawa, what goes in this city appears as bloodsport. Yet in truth it is quite a close-knit community. We are defined by our disagreements yet though we share a common desire — like most Canadians that democratically invest in this place — to make this country a better place. Though we disagree on the path to get there, we have a mutual respect and odd commonality that is an overzealous interest in the political. Jack Layton and my friends in the NDP stand for many different ideas than I do. But I respect them because they stand for ideas and what they truly believe to be in Canada’s best interest. New Democrats are also fun to have a drink with because a discussion without disagreement is often too sober. I feel modestly blessed to live in a country where the reaction to the passing of a political opponent is profound collective sadness. Jack Layton was a decent man who fought passionately for his ideas. We will miss him. News broke yesterday about the CBC’s Radio Canada hiring former separatist leader Gilles Duceppe to host a show on the french-language network. Canadians are outraged and the story led the front pages of a number of Sun newspapers this morning. When Mr. Duceppe was working to split up Canada from the House of Commons for twenty years in Ottawa he was collecting a paycheque from the Canadian taxpayer. Now that he’s a “retired” politician, he collects $141,000 per year in his gold-plated pension — also paid by the taxpayer. If this isn’t outrageous enough, Duceppe has landed a gig at the state broadcaster. For a man working for independence for so many years, he’s always the first in line for a cheque from the Government of Canada. This shows that the CBC isn’t even holding true to its mandate of being a supposed unifying cultural force for all Canadians. But leave it to the twisted logic of our state-run broadcaster to seek unity through division. And to think that’s what the cultural elites said what Sun News would do! The final outrage? CBC won’t disclose what they’re we’re paying Duceppe as a state employee. We here at the National Citizens Coalition are calling upon Heritage Minister James Moore to extend federal accountability to all Crown Corporations including the CBC. The Ontario Government has a “sunshine” law compels the disclosure of salaries of all taxpayer funded positions over $100,000. We’re calling for the same sort of law to be instated federally. The CBC collects $1.1 Billion worth of taxpayer subsidy every year. How much of this are we using to further subsidize one of Quebec’s most visible separatist leaders? Will you stand with us at the NCC and demand transparency? Click the recommend button if you want the CBC to account for the taxpayer dollars it’s wasting on separatism. UPDATE: Gilles Duceppe has resigned! Posted on August 17, 2011 Author Stephen TaylorCategories ColumnsLeave a comment on We demand transparency! During the London and UK riots last week, many commentators — myself included — wondered about a social media shutdown and mobile shutdown in affected areas. As the riots were coordinated and congregated via Twitter, Facebook and Blackberry Messenger why wouldn’t a society moving to enforce the rule and law and restoreorder to its street hit the killswitch on certain websites and mobile services? To begin, the United Kingdom is a democracy which embraces 800 years of rights stemming from the Magna Carta. In distressed countries where democracy is fragile and non-existent, the use of social media has been a welcome boon for those wanting others to hear their voice. The ability to speak freely — and the use of one’s preferred forum to express it — is a safety valve that allows a diversity of views to co-exist in a society. Clamping the valve and shutting down vocal expression can cause the manifestation of expression to be violent instead. The United Kingdom isn’t a dictatorship and one is virtually free to speak, even via Twitter. The threat by Prime Minister David Cameron to shutdown social networks to restore order would set a terrible precedent. It was reminiscent of the absolute power practiced unblinkingly by governors in Libya and Saudi Arabia. What of the use of the social media to co-ordinate clean up efforts, civic responsibility, and even rescue? On the other side, what consequence of discarded freedom to restore order more obvious than the unchecked abuse of those restoring the order? It has also been argued elsewhere that tabloid television and 24 hour cable news do much to sensationalize and disseminate information that encourages disorder rather than restore or maintain it. Accessible, instantaneous, and compelling information is not only biased to lead when it bleeds (or burns) but the regionally and temporally disparate can all-to-often seem local and immediate, causing panic. Television blackouts are common in China for example, where a recent train crash prompted crackdown of Chinese media which could have seeded criticism of the government. China fears the disorder that could be caused by government criticism. What happens when instead of restoring order via censorship, government looks to preemptively maintain it by doing the same? In all circumstances, speech is like water that runs downhill. Attempts to halt its progress will only create new channels and the more than is done to dam it, the more catastrophic the breach. Instead of trying to shape a new reality, policy makers must recognize and work with the reality that exists. Wisely navigating social media channels can be an advanced and immediate tool for law enforcement while hitting the killswitch will have unintended consequences. And yet, while information control can create a mollified populace, it can also breed ignorance. When we have more information and a more unfettered ability to communicate it, the lower the potential there is for our own societal self-destruction. Libertarians think property owners should be armed, conservatives want the police or army to come and crush the rioters and socialists want to create more entitlements that would suggest these hooligans are owed something. 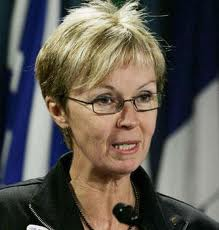 Nycole Turmel is the newly minted interim leader of the New Democratic Party of Canada. She has stepped in while Jack Layton fights another round with cancer. Much was made about Turmel’s past (present?) associations with Quebec political parties including the separatist/communist Quebec Solidaire. But what of the people with whom Turmel surrounds herself? Meet Melisa Ferreira, special assistant to Turmel, according to her Twitter profile. What can we learn from Melisa’s tweets? One, that she supported the Bloc Quebecois, not years ago but during the last federal election! Bien hâte de voir Gilles Duceppe à #tlmep ! Prête à twitter! Let’s hope that Ferreira has turned over a new leaf and has joined the federalist NDP with a commitment to Canadian unity. If she has, I’d welcome her with open arms to pan-partisan project of making Canada a better place. However, this example may illustrate how the NDP became a different party the night of May 2nd.